A few days ago I opened the door on a new learning journey. I am very excited about upcoming peer learning projects that I’m working on in 2012, including several for Packard grantees in India, Pakistan, and Africa as well as the e-Mediat project in the Middle East. It is a great opportunity to ponder the question: How to design and deliver learning experiences for nonprofits that connect, inspire, and engage? What are the best practices? On New Year’s Day, I heard a story on NPR about some research on instructional techniques used by many college professors – the lecture and how it is less effective in an age information abundance. Content delivery is less important then the skill to making sense of it and that needs to be what “classroom time” is about. The instructor’s role should be to facilitate this understanding for their students, not dump content on them. I’ve known this for years, ever since I read Richard Mayer‘s educational research in his book, The Handbook of Multi-Media Learning. The study was of medical school lectures. They gave the students tests based on content and scored them. The questions were keyed to when the content was explained. And the resulting graph is the analysis of 1200 students. 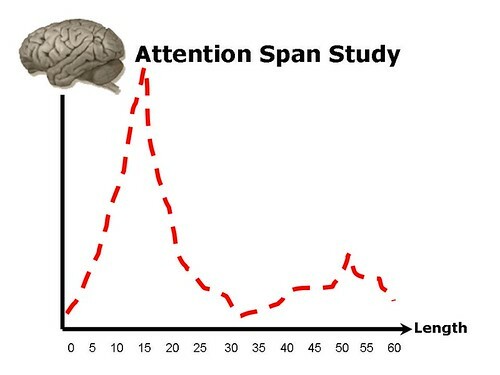 It shows that attention is the sharpest during the first 10 minutes of the lectures, then plummets, and then gradually goes back up but not to the same level. That means talking non-stop for more than 10 minutes, people start to tune out. If your true goal is inspire people to learn, then you need to incorporate techniques so people can process the information every ten minutes. This is important for both online and offline instructional delivery. It is far less work to slap together a powerpoint presentation and prepare the content. But doing that extra work to figure out how to engage your students improves learning outcomes or your results. That’s the theory at least. I’ve been tasked with designing and facilitating a session for trainers during our two-day e-Mediat networked nonprofit and social media bootcamps in Jordan and Morocco. The training for the NGOs that have completed the 5 workshops from the different countries over the past year. The two-days will offer great content, but will also showcase techniques for engaging, connecting, and inspiring participants. I’m doing a session with trainers in Jordan and Morocco in the evening, so I will debrief on the process of the techniques and have them design their own. We don’t have a lot of time and it will come after a long day, so have been thinking of ways to do a train the trainers in an efficient way. This gave me an excuse to look at different types of peer learning exercises and facilitation techniques. Luckily, there is no shortage of techniques and resources and books. Some long time favorites: Nancy White is my go to guru on all things facilitation and has been for more than 10 years! Michelle Martin who writes the Bamboo blog was one of the first bloggers I connected with that was interested in peer learning, reflecting, and training design. She recently took a deep dive into reflective practice and techniques. Allan Gunn from Aspiration and his legendary facilitation skills and knowledge. Joitske Hulsebosch who writes the Lasgna and Chips blog and writes about peer learning in ICD context and use of social media and technology. So, what from this delicious buffet should I put on the plate? This is far too much to cover in the session. I will most likely create a brief handout that provides step-by-steps – a sort of recipe pamphlet. We will use the time to debrief and experiment with a few of these techniques — some of which would have been modeled during the conference. During a training session, psychological safety is important and it takes a little more than having participants introduce themselves. So, the minute participants enter the room, they should be engaged in meaningful, topic related activities that help create a learning community bond. So, it is always important to think about how participants will enter the training, room layout, and what they can do while getting settled. Having devices that allow participants who don’t know each other to get acquainted informally before the session begins are important. If appropriate, an networking activity that encourages people to interact with people they don’t know. NTEN has used this at its conference, trading stickers with other attendees and once you get a complete set, you can enter your card in a raffle. When the session formally begins, it usually kicks off with an icebreaker or two. These are brief, introductory exercises that help participants to get know each other, get connected to the topic, and their own learning outcomes. If one of the goals of the peer session is “networking,” the icebreakers can help facilitate that. Also, if participants don’t know each other yet, it gives them a chance to informally introduce one another. Icebreakers can be done as pairs, small groups, and full group – and you can use a combination. The most important thing is that it has to relate to the content in some way. The KSTool Kit has a list of icebreakers and I’ve used many of them, but in this session I will model one or two. Share Pairs: Share pairs are when you ask folks to find someone in the room and discuss a question. I use this for peer groups to get them to reflect their successes and challenges and to begin to offer peer advice. Some facilitators start with easy questions like “What was it like to get here today.” I created a variation on the shair pair squared. It starts with 2 or three rotations of share pairs, asking folks to connect around their success stories related to the topic and challenges related to the topic. Then ask the pairs to find another pair and share. Spectra Gram: This is a full group exercise that you can use to bring out ideas or different views on the topic. You can also use it get a better understanding of people’s experience in the room. I learned this one from “Gunner” from Aspiration. You get people to line up in the room as to whether they agree or disagree on a provocative statement related to the content – and then interview people. This is useful if you anticipate some skepticism about your topic or want people to feel safe expressing their point of view. Network Maps: When I’ve done trainings that are on the topic of networked nonprofit or networks, are longer-term projects, and the intent is to develop a network, I use this exercise. It takes time and good to do with a smaller group. There is the person to person networking and the exercise I created as “From Me To We Network” which is described here. -Each participant introduces themselves with 3 keywords on a sticky note that explain what knowledge they can share and what they’re looking to learn about. Then the group draws the connections. I’ve also done this with groups of organizations who have collectively created their network maps on the wall. These questions can be done as share pairs and table shares. I like to mix it up and also include solo activities like “Think and Write,” a timed “60 seconds of silence” to reflect on the content without talking, or a self-assessment activity. I’ve also experimented with giving people other ways to process content, using sticky notes and drawings. Living Case Study: The living case study is when you make participants part of the content. A “Living Case Study” is less formal that your traditional case study because it covers a work in progress and shares lessons learned as well as successes. Often, they’re messy, but vibrant and all about real time learning. While the traditional case study is tidy, packaged, and finished – the living case study is open to input, questions, reflections and most of all empowerment of peers. You can work with participants a head of time on a brief, ignite style presentation about a work in progress and have be a longer section. I’ve also use this for keynotes, but it requires doing a survey before to gather up the stories. Here’s an example from nonprofit tech day at Microsoft in Seattle last year. Another way to get people to make sense of the content and apply to their situation is to have them work on it in a small group. It is a good idea to break up a training day into small group and full group work – small groups give people more time go into more depth. Small groups can be conversations, peer assists or shares, or an exercise that can be done collaboratively or working alone together. Conversations: Sometimes just giving people the time to have a conversation around a specific topic related to the content helps them get a deeper understanding of how to apply. One of my favorites is World Cafe, although you need a couple of hours to follow the specific methodology. It is an effective technique to use to help participants process what they’ve learned and to harvest insights.I first met Juanita Brown who created the method through my blog in 2006. I later became a member of the GIGI group (girl geeks of the World Cafe). 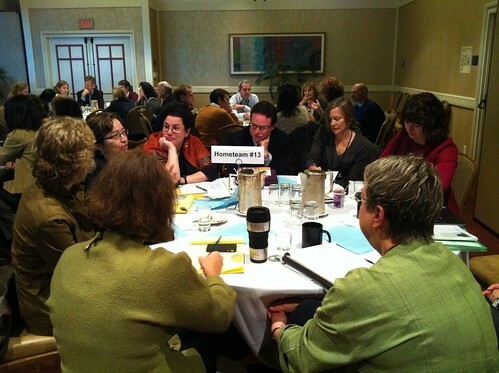 Exercises: These can be collaborative exercises, having a group brainstorm ideas together, can be effective. The “Gift Garden” is particularly useful method. Or if the training is focused on a capacity building technique – for example – how to develop an integrated social media strategy – the exercise could be a checklist for participants to work individually but in a small group. Finally, the exercise could be a simulation or game like the Social Media Game that used cards and helped organizations think through a strategy. Peer Assists/Shares: A peer assist when you put people into small groups and participants help each other by problem solving. You can focus one participant or go round robin and each person gets a turn. A Peer Share is where the participants become the presenters in small groups. My favorite is Speed Geek that I learned from Gunner. It generates rich insights if you combine it with other methods that help participants to process. I’ve incorporated a “Gallery Walk” where presenters created a post and participants had an opportunity to give feedback via sticky notes. Visual facilitation techniques can help with processing as well. I have been integrating social media into instruction for years and it feels weird to me not to have it. Intentionally integrating the use of social media for knowledge capture and to extend the conversation to people outside the room can enhance the learning. I prefer to be very intentional about social media integration, assigning roles and tasks at particular periods. Since I’m often teaching social media, I like to have participants using these skills during the training as much as possible – as long as it doesn’t become a distraction to their learning. Some people actually learn this way, but others don’t. What resources do you need to move forward? What is one thing you can put into practice? I have lots of different closers — gratitude circles, Just Three Words, 3×5 cards to write down what they put into practice, etc. I’ve just learned about a new one called River of Life from my colleague Nancy White and can’t wait to experiment. If you design or deliver trainings, what are some of your favorite techniques and resources? Did you ever participate in a peer learning group or training that engaged, connected, and inspired you? Why did that happen? Thank you for many inspiring ideas. I am about to try my hand at teaching for the first time – a blended online + classroom course in writing that lends itself to building a learning community – and you’ve just jump-started my explorations into techniques to lively up the content. Regarding “great endings”, as a Peace Corps volunteer I used a session closing technique where all members of the group passed an object (any object, didn’t matter what) and shared their reflections while holding it. Then they threw it to someone unexpectedly and asked them a question – it inspired everyone to participate and ensured someone “held the floor” while they were talking. Very effective and fun! Beth – this is a great post, and I appreciate the link you build between evidence-based research/theory and practical tips and techniques for trainers and facilitators. I’ve been building some similar ideas over the last couple of years. The best description of the “Interactive Learning Matrix” can be found in this webinar (https://mafn.adobeconnect.com/p6rk6b8o8yo/) I presented last December. You should take a look at the research-based standards for professional learning put together by Learning Forward. They support your philosophy. Fran, thanks for the pointer to the resource. Do you have a URL? Love discovering more resources. @Don – good for you! Remember it is a journey — you learn and improve as you go. 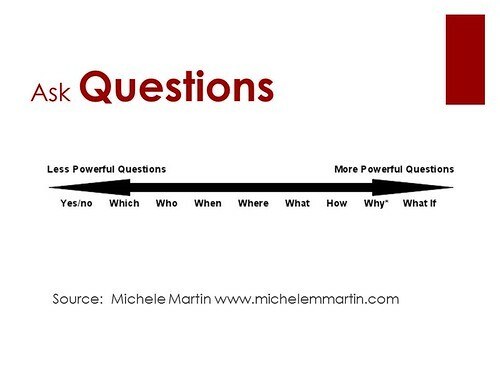 The most important thing for me was to have an half-hour of quiet time immediately after the instruction to write down what worked and what didn’t – an after action review process that Michele Martin points to in her resources. That is how I have learned everything and gotten better at it along the way. This is an incredible list Beth! Thanks so much for sharing. Thanks – totally enjoyed this. I couldn’t help thinking that in a lot of ways, these exercises all work to help turn our meetings into games, and have a lot of bearing on more of what we could be doing to bring play back into our schools. Michael: Thanks so much for sharing your deck and resources – wonderful. Thanks. Yes! Your post is right on. In response all this great content, I wanted to let you know about a convening that EmcArts recently designed for the 8 organizations that received the Doris Duke Continuing Innovation grant. With a lot of the same concerns about the “traditional” arts conference, we put together a 4 day event that incorporated many of the principles you mention above: assigned seating/social engineering, small group facilitation, networking opportunities, share pairs, spectra grams, balancing content delivery and sense making, questioning, working in cohorts, social media integration, and a graphic facilitation at the end to synthesize the learnings. I amazed actually at how many of the same points we hit. Hopefully that indicates that this a new line of thinking around conferences and convenings is beginning to gain traction! The event was hugely successful and we’re eager to share our learnings. Hi Karina: Thanks so much for sharing those responses! I’ve been facilitating interactive social media trainings for arts organizations for a couple of years now and always enjoy that group because they’re used to alternative ways of learnings. And a wiki documenting many, many workshops – not just the content, but the process too. Which makes ask if you have shared your process notes? I didn’t see them. This is a great resource! I expect to reread it many times as I prepare for training others. Thank you. Hi Craig: Forgive my long delayed response! What kind of training to do you do? I’ll look forward to hearing from you about what works!